Tired of getting your face sun burnt when you’re out in the sun, but afraid traditional sunblock will clog your pores and leave your skin looking oily? Try Aveeno Continuous Protection Sunblock Lotionand get the best of both worlds. The sunblock gives you long lasting protection from the suns harmful rays without irritating your skin, clogging your pores or making your face look oily and unattractive. Aveeno Continuous Protection Sunblock Lotion is specifically made for your face and with an SPF 70, it keeps you free from burns all day long. It also has natural soy proteins and vitamins A, C and E which help to further protect your skin. I’ve used this product for many years and can honestly say I have never gotten a sunburn when I’ve worn it. Maybe I’m just lucky, but I’ve put this sunblock to the test (wearing it to the river, working out, every day) and I’ve been consistently impressed with how well it protect my skin without making me breakout. 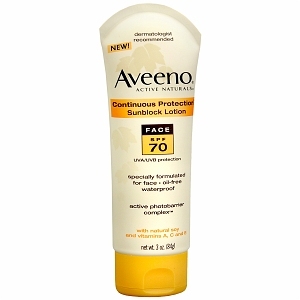 Aveeno Continuous Protection Sunblock Lotion is waterproof, hypoallergenic and non comedogenic (a fancy way of saying that it won’t clog your pores). The lotion goes on smooth and absorbs into your skin quickly, leaving you feeling fresh and protected. I love how water proof Aveeno Continuous Protection Sunblock Lotion is, I’ve been swimming while wearing it, and I didn’t need to reapply the entire day, after getting in and out of the water. The SPF 70 insures long lasting sun protection and I absolutely love how it doesn’t clog my pores or bother my face. With all of the spray sunscreens available now, I can understand why some people would be irritated by the lotions goop and mess, but it’s no more inconvenient than other lotion products. One thing I have noticed, which applys to most sunscreens I’m sure, is that this one hurts very badly when it gets into your eyes. This may be something we just need to accept about our sunscreens, but it would be nice if the formula didn’t hurts, as it is made for your face. If you like the idea behind Aveeno Continuous Protection Sunblock Lotion but don’t want the mess of a creamy sunscreen, you could try the Aveeno Continuous Protection Sunblock Spray with SPF 70. This product is similar to the Aveeno Continuous Protection Sunblock Lotion, but it comes as a spray, and isn’t specifically designed for you face. If you’re looking to protect yourself from the sun without shutting yourself indoors, I would say that Aveeno Continuous Protection Sunblock Lotion is a must buy.